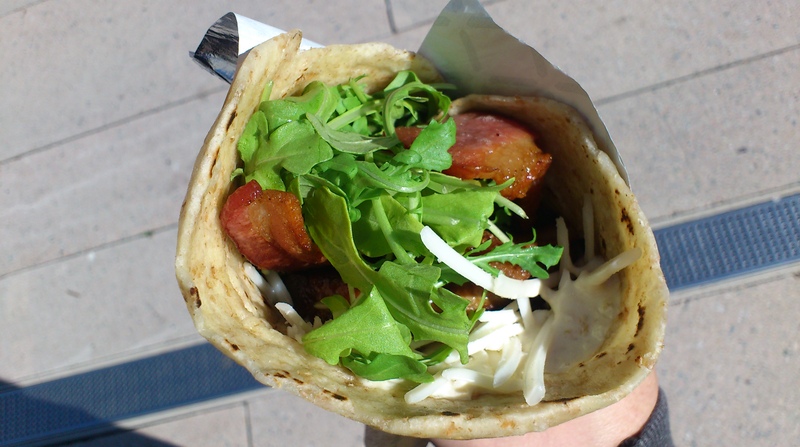 Pig on the Street – Food Truck Friday!!! Every Friday, if I’m downtown, I try to have lunch at a food truck. 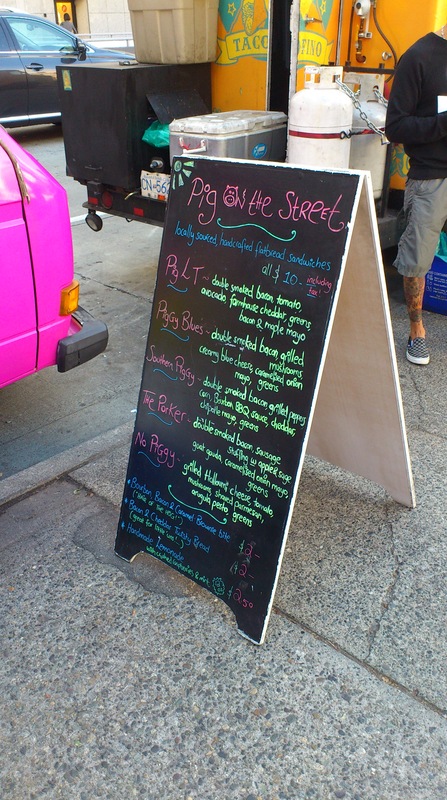 This week I tried Pig on the Street which is probably the smallest food truck in Vancouver. It’s actually not a truck, it’s a Volkswagen camper van and it’s super cool. They make flatbread sandwiches, soups and delicious sounding (I didn’t have one) Bacon, Bourbon and Caramel Brownie Bites. Almost everything on the menu is “Pork-centric” with the exception of the vegetarian sandwich called the No Piggy. 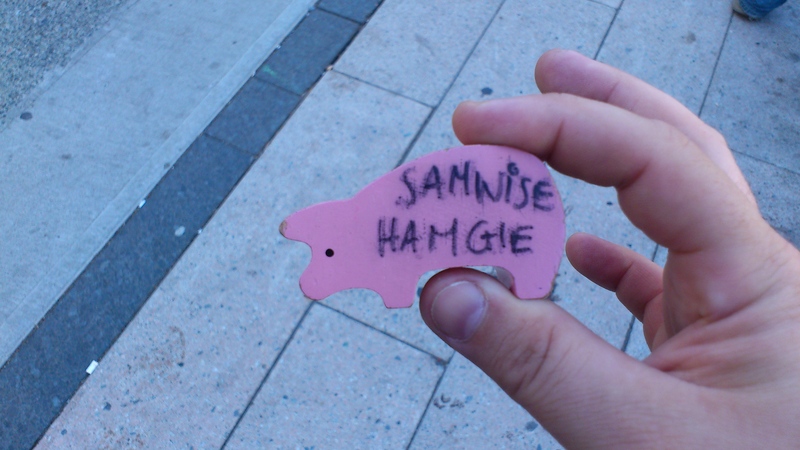 When you place your order you’re handed a small wooden pig with a pork related name on it, it works like taking a number but it’s way more fun. I had The Porker which comes loaded with locally sourced double smoked bacon, sausage stuffing with apple and sage, goat Gouda, caramelized onion mayo and greens. $10 tax included is a pretty good deal for this epic lunch. I was FULL and very happy as I settled into my pork coma. The bacon is incredible and the smell wafting down the street from the little Volkswagen is intoxicating. The sausage stuffing is amazing, the goat Gouda is a unique but perfect choice and the mayo and greens finish things off nicely. 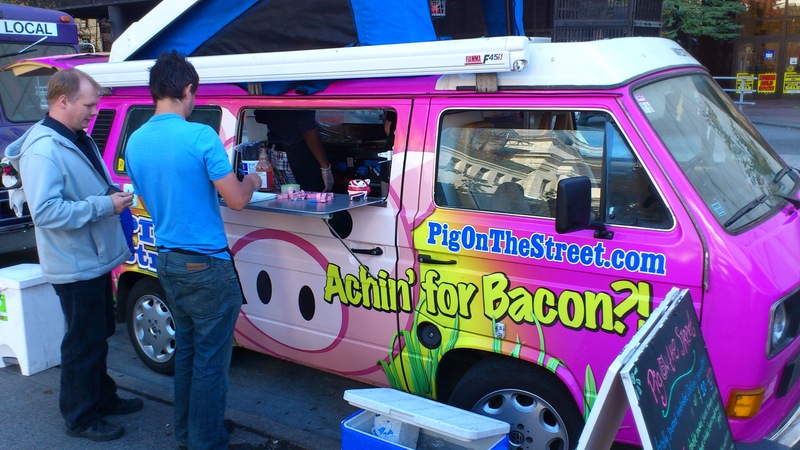 Pig on the Street is the cure if you’re “achin’ for bacon”. You should make Food Truck Friday a part of your routine. It’s easy, fun, delicious and affordable. Download the free Street Food App for you smartphone HERE and get started! !